After years of building a quirky community, bitcoin investor Jered Kenna last month purchased the building at the corner of Mission and 20th streets that houses art and technology creators. With the $7.3 million purchase, the site of the former T-mobile downstairs could become a brewery and pub, and the empty space a door down may become a laundromat and wine bar. The building has a colorful history. Functioning as an SRO hotel until the mid-90s, an aging sign that reads “Sierra Hotel” still clings to its rooftop. After a tenant’s death eventually ended the hotel’s operations, it became a fort for squatters. 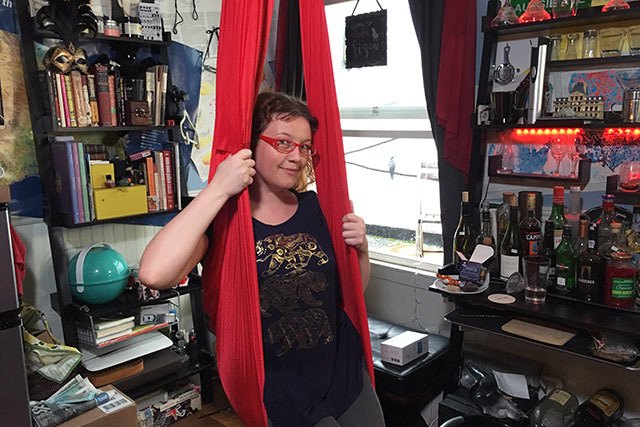 “The building was abandoned, a decade a crack house, then became an unofficial “Occupy” stronghold,” said Stephanie Pakrul, a resident of the startup co-living community 20Mission, referring to the takeover of Homes Not Jails occupiers after longtime owner Edward Litke let it sit vacant for years. When 3491 20th St. fell into Kenna’s hands in 2012, it was abandoned – but the entrepreneur saw an investment with potential. After he was evicted from a SoMa warehouse, Kenna capitalized on a trend of investor-driven communes in San Francisco by leasing the building and creating 20Mission, comprised of 45 people on the second floor. “[20Mission] added 41 rooms to San Francisco – that was something like 2 percent of the housing added that year,” said Kenna. The community Kenna created has attracted many young entrepreneurs and tech workers seeking an alternative place to live and to connect. For this reason, 20Mission is sometimes dismissed as a tech commune. The commercial spaces downstairs, too, need a creative solution. Berkeley Wanner, 20Mission’s building manager, said that offers by larger corporations to rent out the spaces were turned down, and that Kenna plans to encourage local, entrepreneurial talent. That could mean a brewery or a multitasking venue space, or something entirely different that fits into Kenna’s aesthetic of community. Upstairs, 20Mission’s residents have quadrupled over the past four years. With 41 occupied rooms, communal showers and two common areas, the space architecturally resembles a dormitory, but for Pakrul and many of her “housemates,” the co-living space is considered home. Pakrul’s room, though modest in size, is furnished with a loft bed and a mini-bar. It is here that the former owner of a web development company works as an internet personality and cam girl – and most of her income goes towards rent. “My room is medium-sized, so it would go for $1,800,” said Pakrul, although she pays less than that because the building is rent-controlled and the cost of the rooms was slightly lower when she moved in 2013. Other rooms in the house currently rent for between $1,700 and $2,000. While 20Mission residents have found solidarity in co-living, not everyone is rejoicing at the startup community’s presence. “We have been called a hacker hostel, but that’s not really a term that I would use,” said Wanner, 20Mission’s manager. The building is zoned for residential use, which means that there is no cap on the number of days a resident may stay, but that rooms must be rented out for a minimum of 30 days. Despite complaints filed with the Planning Department alleging unauthorized short term rentals at 20Mission, Wanner said that the co-living space is not a revolving door. Four long corridors decorated with colorful murals and named after digital currency such as “Litecoin Lane” form a square around a communal kitchen, where Pakrul has a view of an astroturf courtyard. An active social life is an important part of the co-living space’s culture, and on a Wednesday afternoon, Pakrul is busy party planning. “We throw some pretty extravagant parties,” said Pakrul, who is on 20Mission’s party planning commission. The collaborative throws themed, invite-only parties that sometimes come with roof top performances. In the past, Pakrul said that the parties have drawn as many as 1,000 guests to the space over the course of a day and night — to the chagrin of some of 20Mission’s neighbors. A sticker that reads “Die Techie Scum” is posted to one of two large refrigerators in the kitchen, a cheeky reminder of how 20Mission’s residents are often perceived by outsiders, said Pakrul. Although Pakrul acknowledges the frustrations within the rapidly gentrifying neighborhood, she does not see the 20Mission community as exclusive or solely tech-driven. Ondor Keskin was part of a small group of people who first moved into 20Mission with Kenna, and does not plan on leaving the co-living space any time soon. He said that the social aspects and trust within the co-living space makes it appealing to some. Keskin, a Turkish-born leather designer from Germany, is one of the few artists at 20Mission. He is also part of 20Mission Hive, an art collective that runs out of the ground floor of the building. The storefront operated as coworking space that Kenna rented out before it was shut down by the city. Kenna’s vision of an alternative community of innovative minds bunking together during the onset of a housing crisis originally drew Keskin in. There you have it. Longtime Mission dwellers are the outsiders. Chee-KEE! First of all: true, true, and true, on all three allegations. Thanks for catching that spelling error, we’ll fix it now.